Kit + Cook, a ready-to-cook dinner kit company, was my foray into the business, food, and startup world. I saw this project from brainstorming/idea stage to ready-to-launch. Born out of necessity for a job and a fire to prove others wrong, Kit + Cook became my passion project, my full-time job, and created a buzz in the local Boston food startup scene. Kit + Cook saw two phases. The first in Boston where the 2-person meal kits were intended to be sold direct to the consumer through participating offices. The second phase, in Atlanta, where 1-person meal kits were designed to be sold to extended stay hotels, and made available to the consumer via the onsite convenience stores. Kit + Cook dinner kits could bring international cuisine to your kitchen. Each kit, designed to feed one to two adults, arrived with all ingredients chopped, measured, and marinated. All there was to do was cook. Directions were written so that even the most unexperienced cook could easily and smoothly impress a date with a delicious, homemade, internationally-inspired dish. 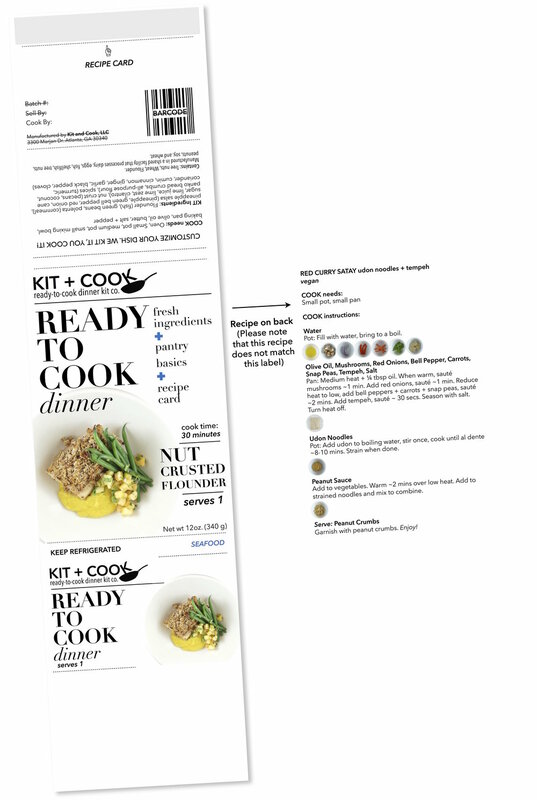 In Kit + Cook's first phase, a direct to consumer kit distributed exclusively through participating workplaces, the label and recipe card were separate. The label served a much simpler purpose, which was simply to indicate the ingredients and the name of person who ordered the kit. The recipe card matured and became much more streamlined in the wholesale phase, as demonstrated below. After having drafted over 15 labels designs, I settled on a wrap-around paper label with the recipe printed on the back. This served multiple purposes. Food safety was accounted for as the customer would know if the label seal was broken, the package has likely been opened, and also provided ample space for cooking instructions on the back. During the pre-launch phase, Kit + Cook recipes and kits were tested and vetted by friends and friends of friends. See what people said. To follow Kit + Cook from the very beginning stages, check it out on Instagram: @kitandcook. It was a fantastic journey that taught me a tremendous amount about business. But more importantly, what I took away from Kit + Cook was a newfound comfort in being in a space of "not knowing." Being okay with my own ignorance and being confident in my ability to figure something out by relentlessly seeking an answer has since taken me far.